WinX Bluray iPhone DVD Ripper is the updated version of WinX DVD to iPhone Ripper with Blu-ray disc support from Digiarty Software. WinX Bluray iPhone DVD Ripper has been designed to rip and backup all Blu-ray movie discs, including AACS MKB V1 to AACS MKB V20 to Apple devices such as iPhone, iPhone 4, iPhone 3GS, iPhone 3G, iPad, iPod, iPod touch and Apple TV. The Blu-ray ripper program has been improved with the ability to convert Hollywood, Disney Blu-ray DVD movies to iPhone supported formats. No 1 fast Blu-ray ripper software in the current Blu-ray ripper market. Runs at above 65 FPS ripping speed even on a PC which doesn’t turn on Nvidia Cuda and takes only 45 minutes to rip a 2-hour Blu-ray to iPhone 4. Unique Blu-ray reader cache technology that helps prolong the lifespan of Blu-ray devices. Featured with Advanced DVD & Blu-ray disc ripping engine and 128 codecs to provides the highest possible video quality. Supports Blu-ray PGS subtitle, Blu-ray BD+ virtual machine technology and removing Blu-ray BD-live. 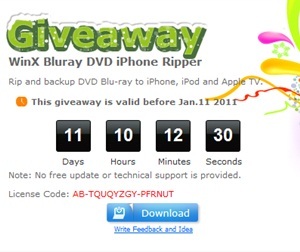 Activate WinX Bluray iPhone DVD Ripper with license code “AB-TQUQYZGY-PFRNUT”.